After the April release of Ubuntu 18.04 LTS, the Canonical development team has announced the final beta of Ubuntu 18.10 Desktop, Server, and Cloud editions. 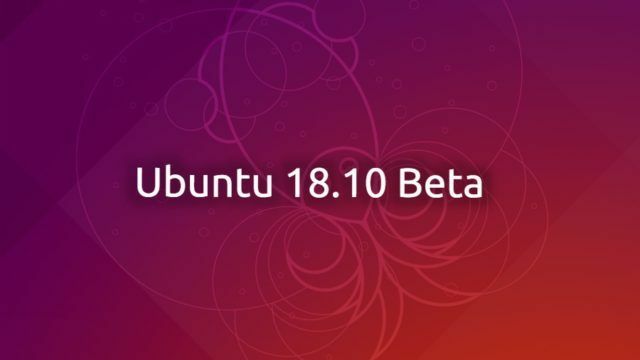 Ubuntu 18.10 was codenamed Cosmic Cuttlefish — a name that doesn’t need any explanation — by Canonical founder Mark Shuttleworth. A highlight point of this beta release is that it’s the final and only beta scheduled for the 18.10 cycle. Before going ahead and discussing the major highlights of this beta, let me tell you the official release date of Cosmic Cuttlefish is October 18th, with release candidates being pushed from October 11th. What’s new in Ubuntu 18.10 Beta? First things first: the look of Ubuntu is going to change with the new Yaru GTK theme — previously called Communitheme — with the new Suru icon set. A new theme was expected to arrive with 18.04 but that plan didn’t work out. Changes have been made to make sure the Ubuntu Desktop installation is now faster. This is due to the Zstandard lossless data compression enabled by default. On the server front, the next generation Subiquity server is there to faster installation and live session. The new installer doesn’t contain some previous options, so the “debian-installer” image continues to remain available. As expected, Ubuntu 18.10 Beta comes with GNOME 3.30 desktop environment as default. So you’ll see all those new GNOME features with a few visual tweaks. Talking about the kernel, this release is powered by Linux 4.18, which brings obvious fixes and better hardware support. Out-of-the-box Android integration was another exciting feature that was rumored to arrive with 18.10, but the development team dropped the plans for this release due to some reasons. Let’s hope that this feature arrives with next release. Apart from the beta images of Ubuntu 18.10, you can also grab the same for all other official Ubuntu flavors — Kubuntu, Lubuntu, Ubuntu Budgie, UbuntuKylin, Ubuntu MATE, Ubuntu Studio, and Xubuntu flavours. You can visit this link to download the beta images. Do give them a try and share your views with us. Also Read: How To Mount ISOs And Other Image File Types In Linux?